There are two things that every coffee-lover wants. For the world to pronounce espresso right and for a plant-milk alternative which froths really, really well. While we can’t promise to solve the first (if Clooney can’t, who can? ), we have created a new barista hemp milk that froths to perfection and does a latte good for the environment too. (Stick with us and there are more puns where that came from). The UK drinks over 70 million cups of coffee a day, with one in five ordered with a dairy-free plant-based alternative. Imagine the impact if that plant-based barista milk came from one of the most sustainable plants on the planet (and was good for the people on it too). We’re on a mission to replace bad with good – that means no more animal emissions, no more deforestation (sorry soya), no more unhealthy stuff and no more poor substitutes. But we knew if we wanted to convert the world to hemp, we had to get to their coffee first. Up until now, we haven’t had a foolproof product, worthy of your morning cup. Don’t get us wrong, our creamy hemp milk always tasted great in coffee and we never split in hot drinks, but when it came to the froth, we always fell flat. So our founders teamed up with some experts known as Volcano Coffee Works (the guys on a mission to introduce the world to coffee that’s better tasting, better for the environment and better for the farming communities) to create a smooth and frothable barista milk, that performed technically and tasted great – that was good enough for your award winning barista, to your pyjama-clad coffee expert at home. 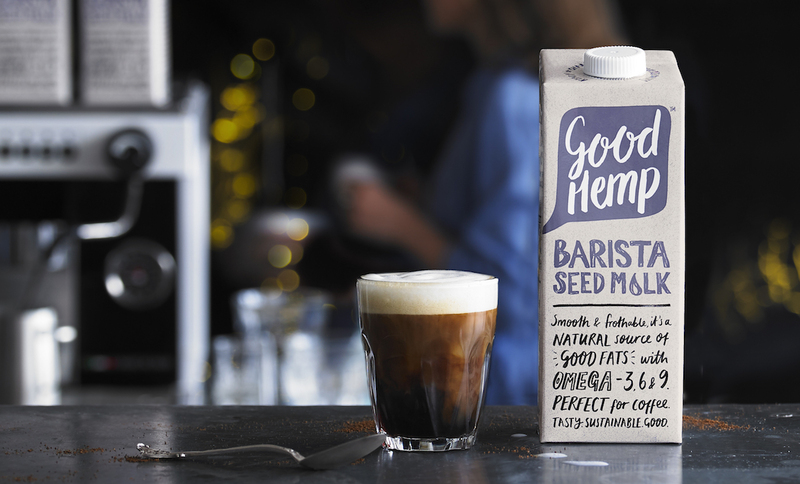 We called it Good Hemp Barista Seed Milk, because we like to keep things simple. We’ve worked tirelessly with Volcano Coffee Works to make a milk that froths with the strongest espresso you have got. How did we do it? With hemp of course. We added an extra 0.5g of hemp protein to the recipe which binds everything together and gives it an incredible ability to foam. To stop splitting, it does include an acidity regulator (but it’s all sustainable and plant-based). Hemp has a light, nutty flavour (a bit like a cross between a sunflower seed and a pine nut). Our barista milk version includes pure malt, a subtle sweetener which offsets the bitterness of coffee and gives it a rich, creamy taste. This means it’s perfect for your latte, flat white or white americano, but it also works great splashed into tea and poured over cereal. The great thing about hemp is that it’s naturally packed with good fats – omegas 3, 6 and 9 that is – which aid skin, brain and heart health. With the rise of plant-based diets, hemp is one of the most effective ways of getting omegas without eating oily fish – one glass has twice as much omega-3 as a tuna steak. In fact, hemp milk is actually the only milk alternative that is a good source of omega 3 – not even dairy can claim that! Need more convincing? Our dairy-free hemp drink is low in saturated fats and free from cholesterol. It has no nuts, no dairy, no soya, and no gluten. Here’s a fun fact: just one hectare of hemp offsets a years carbon from two cars. If that’s not grounds to switch your coffee to hemp milk, I’m not sure what is. There’s more (and we’re not talking about coffee puns): the plant doesn’t need any nasties to grow (that’s pesticides, herbicides or fertilisers) and grows in just four months. There’s definitely no deforestation involved and water wastage isn’t an issue – the plant actually has the ability to irrigate itself naturally. Oh and the excess leaf matter regenerates the soil. All this happens while the plant is essentially cleaning up the air around it, breathing in enough CO2 to make it basically carbon neutral. We’re often asked about the eco profiles of our packaging and the answer is that they’re the most friendly options available to us at the moment. Tetra Pak® cartons are principally made from a renewable resource (wood) but they are tricky to recycle (as most councils don’t separate the plastic and carton). As for the plastic bottles, they are the most recycled form of plastic bottle in Europe. Bioplastics aren’t available for our product currently, but as soon as they are…we’ll be the first to jump on board. If you’d like to learn more about hemp’s benefits to the environment, view our blog here.